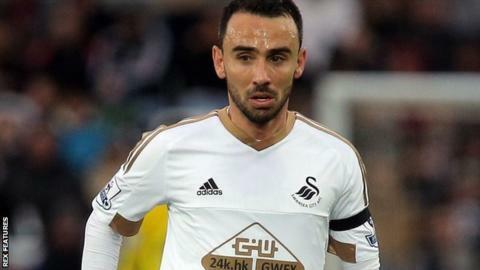 Leon Britton says Swansea City have to be careful not to be "cut adrift" in the Premier League relegation zone. The manager-less Swans are 18th in the division after Sunday's 0-0 draw with West Ham took their poor run to one win in 13 league matches. "The wins need to come sooner rather than later," said midfielder Britton, who has played over 400 Swansea games. "You can't keep saying 'next week, next week' because, before you know it, time runs out and you're cut adrift." Swansea play West Brom at the Liberty Stadium on Boxing Day followed by an away game at Crystal Palace on 28 December. The 33-year-old midfielder played for the Swans in the old Division Three in 2002-03, and was a key man in the club's climb to the Premier Division. Having been a part of three promotion campaigns, the former West Ham and Sheffield United player says he does not want to be part of a relegated squad. And although the club has been without a manager since the dismissal of Garry Monk on 9 December, Britton believes the appointment of a replacement should not be rushed. "I think the main thing is the board get it right, they take their time and they choose the right man because in the meantime they've got a safe pair of hands in [caretaker manager] Alan Curtis and Dave Adams," Britton added. "My journey at Swansea has been fantastic. We've all talked about it, we've won promotions and when we've got to the Premier League we've done fantastic. "But we want to make sure we remain there - no one wants to be a part of a team that's been relegated." Britton believes it is vital for Swansea to claim points over Christmas and the New Year if they are to rebuild their season. However, he does not think it is vital to have a new manager in place before Christmas. "This time of year is always important, there's a lot of points at stake in a short space of time and if you get some results you can climb up the table and vice versa if you don't then all of a sudden you can drop down the table," he said. "The club have got to make sure they make the right decision, it is vitally important. "If that means it takes another week or two then so be it."